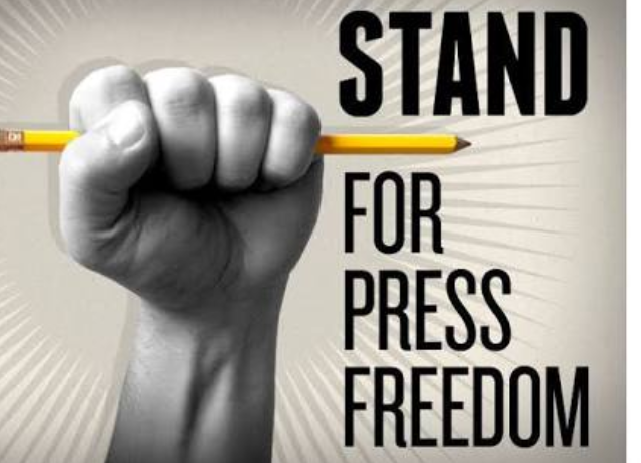 Why the press freedom is on decline in INDIA? Freedom is the core of human society, is so crucial for dignified social life and should only be constrained in special circumstances. In the pre-independent period, Indian Nationalists faced several harsh experiences, when it came to free speech. The colonialist feared free speech as it would unite the masses in protesting against their arbitrary rule in India. To avoid similar experiences in independent India the makers of our Constitution gave primacy to the right of freedom of speech and expression, while drafting it. In fact, this is one of the striking features of the world’s largest democracy and one of the requirements for it to succeed. But the latest press freedom index published by reporters without borders is not a good sign for a democratic country like India, at all. India was ranked 136 in the list of 180 countries. Indian media is often criticised for its deteriorating reporting standards, jaundice coverage of politics and regurgitation of online trends as prime time news. The press council of India functions under the press council act,1978 is a statutory, quasi judicial body which acts as a watchdog of the press. The freedom of press in nowhere mentioned in the Indian Constitution. The right to freedom of speech and expression is provided in Article 19 of the Indian Constitution. It is believed that it includes freedom of press. Every Indian, including press reporters can express Ideas and views freely through press and public platform. The status of press is same as that of an ordinary citizen. But freedom of the press must be subject to those limitations which apply to freedom of speech and expression. These restrictions are mentioned in Article 19(2) which empowers the state to put reasonable restrictions on the following grounds eg:- security of state, friendly relations with foreign state, public order decency and morality, contempt of court, defamation, incitement to offence and integrity and sovereignty of India. 44th amendment has given parliament substantial power to regulate press freedom.A new article 361A (protection of publication of proceedings of legislatures) has been added to the Constitution with this object in view. The censorship of press is very crucial and sensitive issue. In general, press censorship is regarded as very unhealthy check on the freedom of free expression of views. In India, the constitution does not specifically forbid press censorship. Hence, only check on the state in resorting to censorship is that it should be reasonable.Present position is censorship is valid in times of emergency if it is reasonable and if it in the interest of public order. According to the report, 54 journalists have come under attack. In large part the threat to the Indian media’s ability to preserve plurality of views is due to a flawed regulatory architecture that does little to protect press freedom and more to silence it. * Fear of sedition charges. Prosecution are also lured to gag journalists who are over critical of government with some prosecutors invoking section 124 A of the penal code, under which sedition is punishable by life imprisonment. This encourages self censorship. *The watch dog was also critical of social media and internet gag in Kashmir and said that in the absence of any “protective mechanism”, coverage of sensitive regions continued to be ” very difficult”. Here is what RSF said about press freedom in India. Threat from Modi’s Nationalism with Hindu nationalists trying to purge all manifestations of anti- national thoughts.Self censorship is growing in mainstream media. Journalists are increasingly the target of online smears by the most radical nationalists, who vilify them and even threaten physical reprisals. * No law for protection of sources. In India, there are no statutory rights accorded to journalists to protect their sources. This make uncovering the truth tenuous. Though section 15(2) of the press council act does provide protection to the journalists from revealing his sources but it is only applicable to proceedings in front of press council. No protection is available to the journalists before the court. It’s true that social media has both pros and cons. Nowadays it is common to abuse/ troll anyone who has an opposite view. Journalists are the worst hit, in such abusive campaign. The trend of decline in free speech is worrying. Press or media is considered the ” fourth pillar” of democracy. Therefore its independence must be preserved for sustaining democracy. The government, political parties and media can do several things to ensure independence of press. Akansha ji, I think, the press freedom we enjoy in India is unparalleled. See the print media, internet, TV discussions etc. there is open discussions without any bias. I hear people even abusing the power that be besides criticizing the policies without let or hindrance. If this is not freedom of expression then what it is, I do not know. We have seen the worst time during emergency what was the freedom of expression, compare that as on today. Mere whining is not enough. It should be kept in mind what you want to project. Year 2016 was a year in which cases of sedition, defamation and censorship of arts reached record numbers. According to sources last year saw 29 internet shutdowns, compared to 15 in 2015. India is ranked 3 points down from last year. This decrease is self-sufficient to show that press freedom in India is deteriorating. You might be aware of all the attacks on journalists. This encourages self censorship. It is time to examine the threats and attacks much more seriously than we have thus far. Objectivity in reporting has suffered significantly due to rapid growth in the number of media organisations in print, online and television sectors, along with increasing commercial pressures. Respectfully, from the account you have given, there seems to be gross violation of freedom of expression guaranteed by the Constitution of India and especially so, from the year 2015 onwards. Cases of sedation, defamation and censorship are enforced according to the violation of laws. Anyhow the respective cases could be taken to the Court and their decision remains binding on all the parties; it may be governmental agencies or concerned individual whose rights are said to have infringed. Objectivity has a wonderful connotation but this objectivity should carry with it reasonable ethical, moral, rational standpoints when it comes to reputation of nation as a whole. Sometimes we abuse of history and sometimes we abuse our culture and many a times we resort to lowering the very honour and reputation of the country in the eyes of global community. Can you mention even a single country wherein there is laissez-faire; unhindered freedom to abuse anybody anywhere which goes without reprimand? And madam, was there more freedom of expression before 2014, I shall not mention anything about emergency era! Our freedom of expression is maximum when some of our Apex Court judges freely air their views however divergent these may be! Is not it a freedom of expression of highest order. Have you observed or heard any other country wherein this happens? This freedom is only in our Nation. Is not it? Very interesting and informative! i think that the “freedom of the press” is under pressure in a few places in the world. I think we have to be aware of this and be ready to defend this freedom when necessary. Very well written article Akansha ! Freedom of expression is quintessential pillar for civil liberty. Britishers tried to gag the press through various acts and laws such as Vernacular Press Act, 1876, Indian Press Act, 1910 etc. Presently also there are many cases of gagging the press and attack on journalists, both physical as well as online abuses, have surfaced. But what I feel is that Press is also responsible for this at some extent. The fairness and unbiased reporting is missing these days. Press is run my corporate houses or are preoccupied by some ideology. Many of the newspapers and TV channels have became the mouth piece of either government or the opposition parties. We can easily identify which newspaper/ channels are on whose side. This is very dangerous. Probably an year back, during Ramnath Goenka Award ceremony in the presence of Prime Minister, one of the journalist said, and it was widely circulated and celebrated by some section of media, that “Criticism from the government is a badge of honour for us”. After listening this and its defiance against the government might be looked as the courageous and bold act, but in depth reflection will suggest something else. Every one of us acts on things which can fetch us pride and honour, be it exams, performance in the company etc. But if the journalist will do their act to only get criticism of the government, then there will be absolute anarchy. Good things will never be go down to the common, only negativity and skepticism will percolate. I my view press, being considered as the fourth pillar of democracy, should desist from being partisan, rather they should function in transparent, unbiased and professional way. Laws, Rights and Crimes Create a free website or blog at WordPress.com.